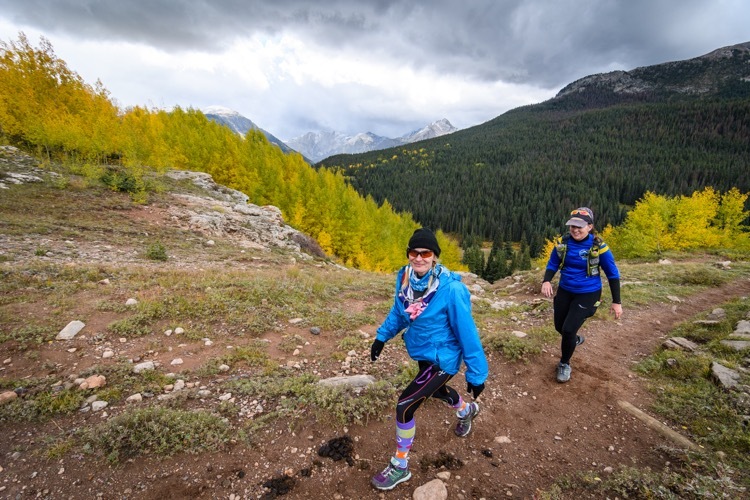 Editor’s note: The Silverton Double Dirty 30 has changed its name to Silverton Ultra Marathon. She didn’t mean I had set a personal best for distance, speed, elevation gain, or altitude – as an ultra-runner from Leadville, Colorado none of that was new to me – but I had redefined the limits on the severity of conditions through which I could persevere. I had driven to Silverton the morning before, and as I do each time I visit Colorado’s great southwest, I felt the magic of the San Juans long before I arrived in town. The dramatic peaks were dusted with snow on top and covered with blazing yellow and red aspens on bottom. Every curve of the Million Dollar Highway leading into town offered a stunning perspective. Silverton itself captures me equally. Whenever the Durango-Silverton train marches into town, the iconic whistle echoes off of the peaks and across the town’s few streets. You can’t run more than a mile on a trail in any direction without coming across relics from the mining boom of the 1800’s, and in fact, the town’s history is so rich at times it’s as easy to be transported temporally as it is spatially. The Silverton Double Dirty 30 drew in me because of my love for these San Juan mountains. Especially for someone like me who doesn’t quite have enough Hardrock 100 lottery tickets to have a chance of entry before 2200 AD, it’s the perfect race. The 55k and 100k options are both Hardrock-esque with plenty of climbing and altitude. I ran with two goals: finishing and finding joy. In the prior two years, I had had three consecutive DNFs. Yes…three. I’d become quite skilled at quitting. For each failure, I harbored a list of excuses. For instance, I dropped from the 2016 edition of the (Polar) Bear 100, because I couldn’t stay warm with 24-hours straight of torrential rain and temperatures just above freezing. After a night of sleep in a warm cabin, I watched with incredulity and admiration as the back-of-the-pack runners came into the finish line . I needed to end the DNF streak, and I found myself thinking, “I just need to have perfect conditions.” That’s when it hit me: mountain running never goes perfectly. They’ll often be heavy rain or suffocating heat or wild fire smoke or epic mud. Unpredictable conditions are one of the things that makes mountain running so great, challenging, and even life-changing. Instead of waiting for an easy day, I needed to rediscover my own grit – grit which I had demonstrated plenty of times in past mountain adventures, but had somehow forgotten when I started dropping from tough races. Enter the forecast for a perfect blizzard at Silverton. The weather held for the first ten miles. We ran out of town on the train tracks cutting through the Animas River gorge. The other runners were clearly as hardy as those who had finished Bear the year prior. I could tell by their conversations, their gear, and the size of their calves. Instead of focusing on spiraling thoughts, I got lost in the scenery – the granite peaks; the reds, oranges, and yellows aspens; and the turquoise river. That part of the gorge isn’t accessible other than via the train, and witnessing the Weminuche Wilderness, so relatively untouched, was a privilege. A woman from California named Nicole Honda chatted with me in those early miles. Like me, she wasn’t concerned about time, just finishing and doing so safely, and we decided to stick together. The precipitation started as we climbed towards Engineer Mountain and 12,000-foot-plus Rolling Pass. I shrugged off the frozen graupel, but then the wind picked up. Snow flew into our faces. Our eyelashes froze. By tree line, inches of fresh snow obscured the trail. Even the footsteps from the runner in front of us were already vanished. Our only directional clues were the well-placed stakes sticking out of the snow. Nicole and I became two penguins waddling one right behind the other, taking turns exposing ourselves to the wind. For those miles, we continued to move out of self preservation far more than for a finish line. At the aid station a half mile from the course high point, volunteers huddled together with their necks and chins burrowed in heavy coats. They had carried supplies up the mountain, camped, and waited for us in this blizzard for all of these hours. Nicole and I each chugged a cup of miso soup. We couldn’t do much more to help ourselves; our hands were so cold working our water or food packaging was next to impossible. I still can’t imagine how those volunteers stayed warm enough – and chipper enough – to serve us when we came through. Those same volunteers would later find my phone which I would drop in the snow not far from there. Volunteers: thank you! By the next aid station, Nicole and I had descended to below 10,000 feet. The trees provided some shelter from the wind, and the worst of the storm had passed. Still, I shivered. Yet another heroic volunteer helped us sort through the layers of clothes we had stuffed in our drop bags, and we made a complete wardrobe change. Even in dry clothes, I struggled to warm up. My hands still didn’t work properly. I sat, ate, and held my hands over a stove until my fingers could function again. Ten miles remained. I had all the excuse I needed to drop. Instead, I found strength in our team of two, in the majesty of those mountains, and in the generosity of the volunteers who served us. Nicole and I left the warm aid station and continued on.